Farrin Peterson, 26, from Roseville in Northern California, is an honors student in her fourth year of studies at the University of California Davis School of Veterinary Medicine. She's also named to ride Chocolate Goddess for trainer Aggie Ordonez in Friday's second race at Del Mar. And you thought you had a busy and complicated life, didn't you? “I did have an agent, but then when my schedule at school got too complicated I decided to be my own agent the last few months,” Peterson said Thursday during a short break between exercising rides on six horses for three different trainers. Peterson spent the month of June between Kentucky and Japan on a veterinary internship and the month of July in Dubai in a similar assignment. She returned just a few days ago. 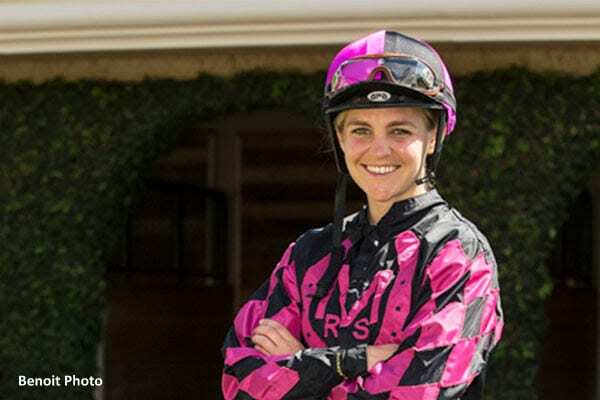 “It took time away from the jockey thing, but I figure the stewards will give me the time back, because I had already started my bug (apprentice weight allowance) and hopefully I'll get to keep it through Del Mar of next year,” she said. Riding what amounts to part time since February, she has recorded seven wins from 65 mounts with five seconds and 14 third-place finishes. That's three wins shy of having the “bug” dropped from seven to five pounds, where it will stay for the remainder of a one-year apprenticeship. The Chocolate Goddess call is her first opportunity to ride a race at Del Mar. But she's familiar with the track. Peterson didn't grow up in a horse racing family, but one that had some attachment to equines. In the 13th day of the meeting, she'll be the first female jockey to ride at a track that, for one recent meeting, had five women in the jockey colony. “No way!” Peterson exclaimed when informed of the situation. Chocolate Goddess, a 4-year-old daughter of Square Eddie, has three wins in 19 starts and career earnings of $69,869. She's been away from racing since December 30 of last year. Her last four starts were all on the artificial Tapeta surface at Golden Gate Fields. “I'd been working with the trainer (Ordonez) and we talked about how we both wanted to race at Del Mar,” Peterson said. “She told me, 'I have this filly that might be my Del Mar filly,' so I got on her to breeze her. The routine went on for a few weeks. Then Peterson had to leave for Dubai. Races during Peterson's stay in Dubai were considered as possible starts for Chocolate Goddess. Other riders had to be recruited for morning workouts, complicating the decision for Ordonez and the owning McLean Racing Stables whether to save the mount for Peterson or award it to another rider. Peterson monitored the situation anxiously from Dubai. Chocolate Goddess is 20-1 on the morning line for the allowance/claiming event with a $62,000 purse. Her given name, not exactly common, has significance in the family. “It means 'Iron,'” Peterson said. “Ferric is iron on the periodic table. My first chemistry class, when I saw that, it all made sense. My parents always told me, 'You have an iron will and you're tough. This entry was posted in People and tagged Del Mar, dubai, farrin peterson, UC Davis school of veterinary medicine, university of california by Del Mar Thoroughbred Club. Bookmark the permalink.